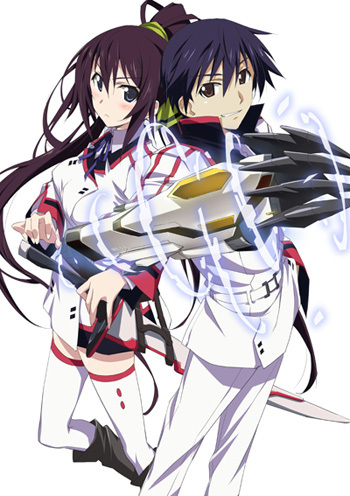 Summary: Japan engineered an armed powered exoskeleton “Infinite Stratos” (IS) and it became the mainstream of weapons. Since only women can operate IS, women dominate the society over men. Orimura Ichika is a 15 year old boy and accidentally touches an IS placed in the IS pilot training school. He is found to be the only man who can operate IS and forced to enter the training school. Ichika’s busy school life surrounded by girls has begun. 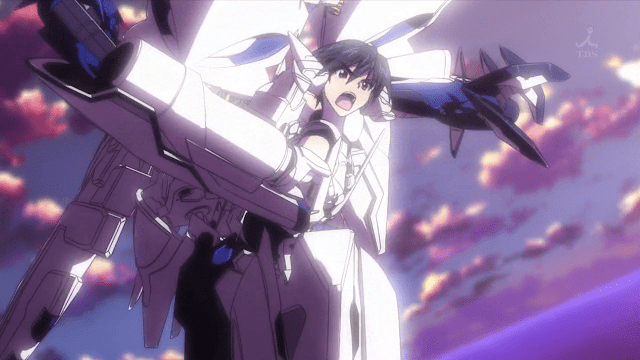 Review: Infinite Stratos starts off with a stunning battle scene between two heavily armored mechs rendered in a beautiful CGI that, surprisingly, doesn’t clash with the 2D animated pilots. That initial battle scene had me eager for more but that, unfortunately, isn’t what we received. The rest of the episode turned out to be a standard school harem comedy, just with the prospect of mech battles looming in the background. Ichika, being the only man who can pilot an IS, is tossed into a school filled with woman who find him fascinating. The only girl who doesn’t is his childhood friend and, of course, that is the only girl Ichika is really interested in. Infinite Stratos accomplishes some amazing feats as it builds cliché on top of cliché setting up the premise in the first episode. We have a protagonist surrounding by beautiful woman, a Tusndare main love interest who is the protagonists childhood friend who ends up sharing a room with him, the protagonist’s sister is a popular teacher who reacts violently to anything the protagonist says to her, and we have the preppy girl who thinks she is better than the protagonist because of some upbringing blah blah blah. Worse yet, the back story for the show is explained entirely through expository dialogue, just about the lowest form of world building possible. Whenever a character says something that should be obvious to them and every character they are addressing it completely takes me out of the show, for example the preppy stuck up girl was bragging that she defeated a teacher in the IS during the opening ceremonies… and that allows the protagonist to bring up the fact that he did as well. They were at the same Ceremony! Wouldn’t they both remember what happened?! Why does this bit of dialogue need to exist! The opening ceremonies are brought up so much that it is shocking they didn’t just start the series at that point. That is the launching point for the entire narrative. The Ichika is at this school because of what happened that day and yet the show skips ahead to the harem comedy portion of the series. Clearly, Infinite Stratos isn’t striving to be anything more than that. Even so, I didn’t find Infinite Stratos too offensive. Remember that you are getting into a dumb haram comedy, shut off your brain and you should be able to get through the first episode. I’m holding on for a little bit just for the prospect of more Mech battles like the one teased before the opening credits. The art is nothing special but the character designs are extremely pleasing to the eye, if a bit generic. The show is escapist anime at its height, a dopy guy gets to be around beautiful woman AND pilot mechs! If I was thirteen again that set up alone is good enough to make this the last show I’d ever need. 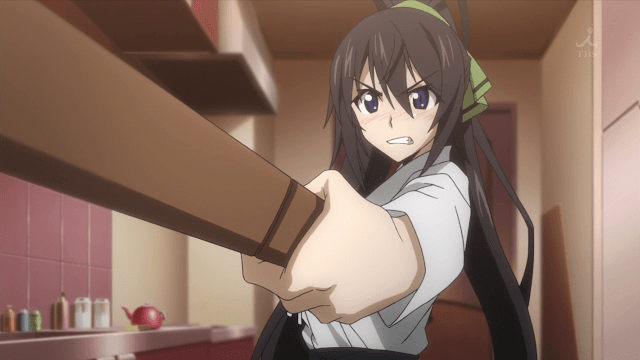 Verdict: Let’s just lay it on the line; Infinite Stratos is a dumb show. The setup is painfully cliché and the majority of the characters fall neatly into anime stereotypes that go back twenty years. The mech battle and character designs are extremely well done and while that doesn’t make a good show it might be enough to sustain a guilty pleasure. Hey, it’s still better than Jersey shore. "The only girl who doesn’t is his childhood friend and, of course, that is the only girl Ichika is really interested in. "Unless I missed something, you're wrong. Ichika does not show any romantic interest to any of the girls. I don't know how many episode you've seen of IS, but episode 3 is the closest Ichika came to expressing interest in a girl, which is Fang the chinese girl. But even that interest seems platonic rather than romantic.Otherwise I think your review of Iinfinite Stratos is fine. If you are still uncertain about IS, make sure you watch episode 4. Lin's mecha is very cool (specially her humongous decorated dual blade; I'll definitely check out the figurine when it's out) and they show the first signs of an overarching plot. There's still plenty of WTF moments, though.